Many People get their Furnace and Air Conditioning checked yearly, but neglect the heart of the electrical system that runs their entire home or business. Problems can occur unexpectedly, therefore it is good to have it inspected for potential problems annually. Common Problems found that can cause serious injury or death are: Water infiltration, poor connections, loose or bad grounding, no cover on the fuse box, corroded terminals, and loose circuit breakers just to name a few. Incorrect circuit breakers and incorrect fuse values also pose a serious risk. If you still have a fuse box in your home or business, it’s way over due to be updated. Why? Because, heat over time can damage the inter structure and can make things weaker than when manufactured. The out side Electrical Service Line can be acting as a conduit for water to be leaking into your electrical system. With conduit, heat rises up from them and mixes with the moisture and can make a rain like sweating effect on your existing fuse or breaker panel. Just because it has been replaced doesn’t make it bullet proof. It is always a great idea to take a peak behind that cover and examine the breakers, fuses, and wiring for heat damage and water damage at bare minimum. Call us today for your Electric box inspection to see what problems are larking in your breaker or fuse box. Rip that old fuse box right off the wall says Inspector Waldron, Owner of Waldron Electric. Fuse boxs cause fires due to overloading circuits, too large of a fuse, bare outside lines letting water drip through to the main fuse connections. Like an old car, fuse boxes only last so long. They thermally can break down, causing serious bodily injury or even death, unexpectedly. Fuses were a sign of the times fifty years ago, however technology has risen to incredible levels of new safety standards. Call Waldron Electric today to get your fuse box ripped out and a new safe breaker box system installed the same day. An independent study showed that Federal Pacific Stab Lok breakers failed to trip as much as 80% of the time. Does your home have a Federal Pacific panel box installed? When water can start a fire. Usually water and fire don’t mix. When the fire crew arrive, what’s the first thing they put on your burning house? Right. But when water mixes with electricity, it almost might as well be gasoline. Water, or even dampness or moisture, can create leakage current — a form of short circuit — across the electrical contacts of a switch, fixture, or anything else with exposed conductors. This low-grade short circuit can evolve into a full-fledged electrical pathway through chemical reactions and the buildup of carbon. The result: either a lot of heat or an electrical arc, either of which can start things going. Typically, wiring in the wet areas of your home or car is done in such a way as to keep contacts away from moisture … if it’s done by a properly licensed electrical contractor. Just another good reason to give us a call for your next home repair! 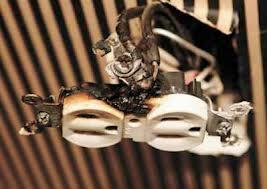 One of the easiest ways to protect yourself from the danger of electrical fires is to be aware of conditions in your home that can lead to fires. One of the most common of these conditions is a short circuit, or “short.” If you’ve ever accidentally contacted a bare wire and felt a shock, you’ve created a short circuit — a direct path from the power source to ground — with your body. This kind of short doesn’t usually cause a fire, thank goodness, because you jump back when you feel the current and break the flow of electricity. Other kinds of shorts can be more dangerous, though, and it’s a good idea to keep an eye out for them in your home. A dead short occurs when a live wire comes in direct contact with a ground wire, for example in a poorly wired light fixture or a frayed electrical plug. In this situation, current flows directly from source to ground instead of through the light or the appliance, and can cause the wires to overheat. In a properly wired home, a fuse or circuit breaker will trip and prevent overheating and potential fire. A limited short is when wires come into contact with each other in such a way as to cause a spark. The heat of the spark can melt the copper wire and ignite flammable material nearby. Limited shorts can be extra dangerous because they may not draw enough current to trip a circuit breaker. To prevent shorts, get rid of appliances that have frayed cords … and have any home wiring done by a licensed electrical contractor. When it’s OK to blow a fuse. We all get overloaded from time to time … too much work, too much pressure, too much birthday cake. You get the idea. When a circuit in your home gets overloaded, though, it can be much more serious than a headache or a case of indigestion. That’s when blowing a fuse is a good thing. If you, like many Pittsburghers, live in an older home with older wiring, you may still have screw-in fuses to protect your circuits (more modern homes typically have circuit breakers, which do the same job.) When a circuit suddenly carries too much current, say if you should plug too many hair curlers into the same wall socket, the circuit heats up and causes the metal link inside the fuse to melt and break the circuit. This is what fuses (and circuit breakers) were born to do: sacrifice themselves to prevent your wiring from overheating and starting a fire. The Fire Department and your Friendly Local Electrician tell you to never replace a fuse with anything other than another fuse — no coins, wires, paper clips or bobby pins! And make sure the fuse has the same rating, whether it’s 15A, 20A, or something else. If you somehow manage to replace a 15A with 20A, you run the risk of “overfusing” the circuit — the fuse may not blow soon enough, and the heat could start a fire. This is true of screw-in household fuses as well as the in-line fuses you put in your car, appliances and home electronics. Bottom line: don’t blow it. Let the fuse do it! Conducting a home inspection requires detachment of the panel box covering to make viewing and inspecting the panel interior easier. Checking the internal electrical connections, breakers, grounding, wire type, wire size, panel box condition and main breaker is part of the inspection. Backup power generators: Necessity or ‘wonderful luxury’? John Hill from the Summerset area in Squirrel Hill says the advantages of backup power generators are obvious. “When my lights are on and everyone else’s are out, it’s easy to see the benefits,” says the owner of a backup generator that comes on automatically with any power failure.